Lee Chandler, a handyman in Boston, receives word of his brother's passing in Manchester, MA. He makes arrangements to be there for a week while he settles his brother's affairs and arranges the funeral. It is there that Lee finds out, through the lawyer, that his brother left him in custody of his son Patrick. Lee is a complicated man in his own right. He drinks frequently; he starts bar fights. Deep down, though, he is fighting demons. Demons that threaten to overcome him as he goes back to the coastal town of Manchester. 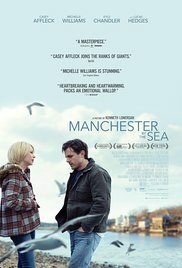 Manchester by the Sea is a poignant movie about grief, and how to keep on living after a devastating loss. Some people are good at moving on, as is Lee's ex-wife Rudi (Michelle Williams), and others, like Lee, just don't know how to keep on living. Through flashbacks the audience is given the full story, the one that is referred only in whispers by the townsfolk, and what a crippling tragedy it is! The musical score is excellent. I was particularly overcome by the fire scene punctuated by Albinoni's adagio. The editing is a little choppy, some scenes appear cut without a smooth transition, but the real power of this movie lies in the story, the narrative choice, which is spot on, and its powerhouse performances, particularly Casey Affleck's. Casey Affleck is one of the surest contenders for a Best Actor's Oscar this year, thanks to his nuanced and raw portrayal of Lee. He already has two extraordinary performances under his belt (i.e., The Assassination of Jesse James by the Coward Robert Ford, and Gone Baby Gone), but for this one he may deservedly win the coveted statue. It will be interesting to see what, if any, awards this movie gets at the Oscars. I've heard and read so many good things about it. If it weren't for the feel-good La La Land, I think this one would beat the other contenders. This film has just arrived in Switzerland, I am dying to see it. The story appeals to me and I am fond of Michelle Williams, a young actress who chooses her roles very well. Casey Affleck even though he is little known, he impressed me in all the roles he played (I advise you to see "The Killer Inside Me" his performance is remarkable). Thank you for this great suggestion. I'll see it this week, without fail. I'll search for The Killer Inside Me. I agree that Michelle Williams chooses her roles carefully. Keep in mind that she has a limited role in this movie. I hope you like it. I just watched this one two nights ago. It really packed an emotional punch I thought. I agree about the cuts sometimes being unsmooth (is that a word? ), Casey Affleck killed it, but I was expecting more of Michelle Williams later in the story. Michelle Williams was great with the little she was given, but it was his story, his journey, and he nailed it. The film seemed a quiet powerhouse of a movie. It did pack a punch, which I didn't really see coming. A favorite. I should rent the Jesse James movie sometime. thx. I kept saying, "What's the matter with him?" and when I saw THAT scene I was emotionally overcome. Mixed feelings for this one which puts me in the minority - my husband loves it and I think Affleck plays a great part - for me, too much realism and not enough escapism. A powerful and emotional movie for sure. The main reveal - omg. I know what you mean by not enough escapism. This movie is brutal in a very understated sort of way. I haven't seen this one but my parents watched it and told me they both hated it. My dad's main complaint was that it was hopeless and had no meaning and my mom was mad about how it portrayed people from Boston (where she and I are from). I have to say, my dad's comments kind of killed my desire to see it. Hmm...It is a sad movie for sure; too bad that you don't want to see it. In my opinion, from the awards movies I have seen so far, this one and Nocturnal Animals were the best movies of the year.